Francisco Venegas Espinoza Maestro. - Reglamentacion . EL PANEL DE ARBITRAJE KUMITE . 1º - EL PANEL DE ARBITRAJE EN CADA ENCUENTRO SERA DE UN ARBITRO Y 2º A 4º BANDERILLEROS . 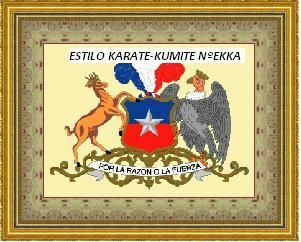 2º - EL TIEMPO DETERMINADO DEL KUMITE ES DE DOS MINUTOS . 3º EL TIEMPO DEL KUMITE COMIENZA CUANDO EL ARBITRO DA LA SEÑAL DE ENPESAR Y SE DETIENE CADA VES QUE EL ARBITRO DICE YAME . 4º EL CRONOMETRADOR HARA SONAR UN GOG CLARAMENTE AUDIBLE INDICANDO QUE FALTA 30 SEGUNDOS ANTES DEL TERMINO DEL KUMITE . PUNTUACION. PUNTUACIONES SON LAS SIGUENTES . A) SANBON : TRES PUNTOS : CUANDO SE CONECTA UNA TECNICA MAWASHI GERI AL COSTADO DEL CABEZAL . B) NIHON : DOS PUNTOS : CUNDO SE CONECTA UNA TECNICA MAWASHI GERI AL COTADO DEL PETO . SE CONCEDE UNA BUENA PUNTUACION CUANDO EL COMPETIDOR REALIZA UNA TECNICA DE BUENA FORMA . NO INSULTAR A LOS JUESES. NO ABLAR GARABATOS EN EL TATAMI. NO GOLPER AL OPONENTE (KO) EXSESO DE FUERZA O VIOLENCIA. NO CRITICAR LOS RESULTADOS DEL KUMITE KATA O DEFENSA PERSONAL. NO RESPONDER DE MALA MANERA. REGLAMENTO FORMAS DEL TIGRE KATAS . TRES PROFESORES Y UN ARBITRO . F)- DISCIPLINA EN LOS MOVIMIENTOS DE LA FORMA . G)-DESPLAZAMIENTO CORRECTO DE LA FORMA . H)- TERMINO PERFECTO DEL KATA . DE 3 A 6 PROFESORES DE ALTO RANGO . H)- APLICACION DEL GI . I)- APLICACION DE KI . J)- APLICACION DE XI .